So many leftovers! I actually had to make more sides to go with the turkey, and we still only got through about half of it. But the very first thing to disappear was the pie, and by last night, we were ready for a fresh dessert. Still being in Thanksgiving decompression mode, I didn’t want to make anything too complicated for dessert, and the first thing that jumped into my mind was the chocolate pudding cake I used to make as a teenager. You know the one—with boiling water poured over the top that sinks down through the rising cake and forms a pudding-like sauce on the bottom of the pan. I think the recipe I used to use was just from my mom’s old Better Homes and Gardens cookbook, but I thought maybe I could find something a little more interesting this time, and tracked down a version with a peanut butter cake base. This cake takes just a few minutes to mix up, and the only fat to be found is in the peanut butter and the egg yolk. I currently don’t have a 8″ square pan, so I used my 9″ pan and the batter was spread rather thin. I also couldn’t help but add a splash of vanilla. Half an hour later, we had cake! 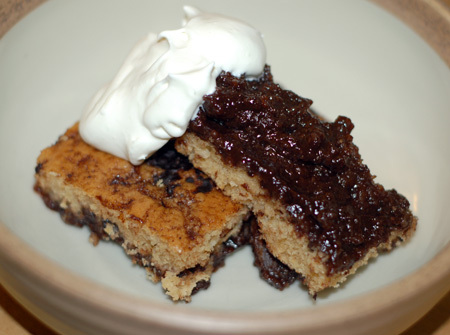 I’m never perfectly happy with the way pudding cakes come out. Maybe it is because of that lack of fat, but they never taste quite as luscious and gooey as I imagine it in my head. So I would definitely suggest a dollop of whipped cream or a scoop of ice cream to go with this, but the flavors were good. 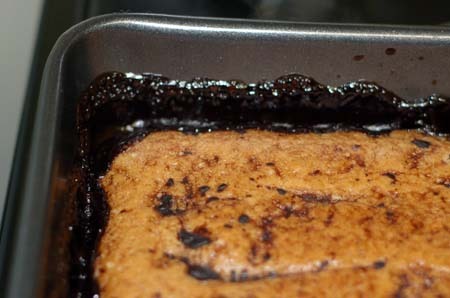 Grease an 8-inch square glass baking dish and preheat the oven to 350F. In large bowl, whisk together flour, granulated sugar and baking powder. Whisk together milk, egg and vanilla; stir into flour mixture, then mix in peanut butter just until combined. Spread into prepared baking dish. 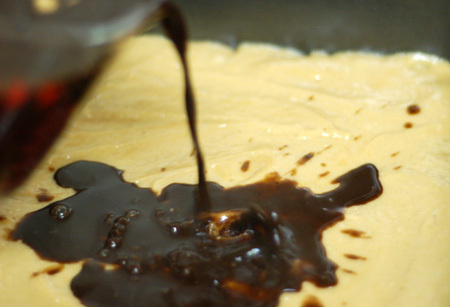 In a heat-proof bowl, whisk brown sugar with cocoa powder; whisk in boiling water until smooth. Pour over cake; do not stir. Bake until cake is firm to touch, about 30 minutes. Let cool for 10 minutes. Anything gooey must be nice. With ingredient Choclate, peanut butter how can this not atrract kids!